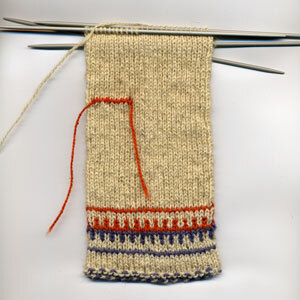 The first mockup of a medieval Votic mitten, in dire need of more research. I must go to Estonian National Museum in Tartu and examine the 17th century mittens and socks there. Only one pair of each, but both have fairly big fragments with surviving cast on edges. I know, I know. 17th century is 400 years latern than 13th, but it's closer than any modern thing that I could come up with. The last time I was there, I was concentrating on garments and didn't take exhaustive notes on the knits. Some day, when I have a week to spend, I'll go back with a whole array of examining tools, prepared questionnaires and a laptop and write down everything from spinning methods to measurements on everything in that outfit. Hopefully I don't have to go back more than once after that. As I know myself — something's bound to be overlooked.